Despite the prevalence of behavioral research conducted through genetic studies, there is an absence of literature pertaining to the genetics of motor behavior. 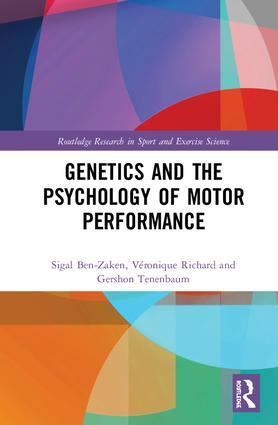 Genetics and the Psychology of Motor Performance is the first book to integrate cutting-edge genetic research into the study of the psychological aspects of motor learning and control. The book’s central line of enquiry revolves around the extent to which psychological factors central to motor proficiency – including personality, emotion, self-regulation, motivation, and perceptual-cognitive skills – are acquired or inherited. It explains how these factors affect motor performance, distilling the latest research into their genetic underpinnings and, in doing so, assessing the magnitude of the role genetics plays in the stages of motor development, from early proficiency through to expertise. Written by leading experts in the genetics of human performance and exercise psychology, and thoroughly illustrated throughout, Genetics and the Psychology of Motor Performance is a crucial resource for any upper-level student or researcher seeking a deeper understanding of motor learning. It is an important book for anyone studying or working in exercise psychology, motor development, exercise genetics, or exercise physiology more broadly. Sigal Ben-Zaken is the head of the genetic and molecular biology laboratory at the Wingate Academic College for Physical Education and Sport Sciences, Israel. She obtained her doctoral degree in biomedical engineering from the Technion, the Israeli Institute of Technology. As the head of the genetic and molecular biology laboratory, her main research focus is the genetic basis of athletic performance, trying to combine different aspect of genetics and performance. Sigal has also acted as a lecturer at the Wingate Academic College. Veronique Richard earned her doctoral degree in sport science from the University of Montreal then went on to complete a postdoctoral fellowship in sport psychology at Florida State University. Her research focuses on the effects of creativity enhancement on motor performance and psychological adaptation. She has a performance psychology practice primarily working as a mental performance consultant with different Canadian national teams and individual elite athletes. Additionally, she is an associate researcher at the National Circus School in Montreal, Canada. Gershon Tenenbaum is the Benjamin S. Bloom Professor of Educational and Sport Psychology and was the Sport Psychology Graduate Program Director at Florida State University, USA. Gershon was previously the Director of the Ribstein Center for Research and Sport Medicine at the Wingate Institute in Israel, and the Director of the Graduate Program in Sport Psychology at the University of Southern Queensland, Australia. He was also the President of the International Society of Sport Psychology and the Editor of the International Journal of Sport and Exercise Psychology. He has published more than 250 articles in peer-reviewed journals and written and edited ten books, handbooks, and encyclopedias. Gershon received several distinguished awards and is a member and fellow of several scientific and professional forums and societies.